Closed Circuit Television (CCTV) provides an added layer of security to any retail store. Whether you run a large-scale electronics business or a small fashion boutique, CCTV cameras can protect your store against shoplifters, especially during the holidays. 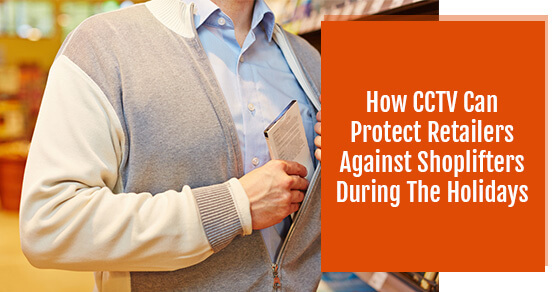 Here a few ways that CCTV protects retailers against shoplifters. CCTV cameras create a deterrent for shoplifters. Criminals will be less likely to steal from you if they notice a security camera, and your staff won’t have to worry about being robbed because most evildoers will see a CCTV system and decide against shoplifting from your store. Any security camera system you have in place acts as a safeguard against theft and crime. CCTV cameras are an extra set of HD eyes on the property that protect your staff against attacks and your merchandise from being stolen. Furthermore, CCTV cameras installed outside help prevent vandalism. If someone is bold enough to vandalize your store, you’ll have it on camera. With modern CCTV cameras, you can access the footage from anywhere. If you’re worried about shoplifters taking valuable merchandise when you’re not at the store, you can watch the CCTV feed from your smartphone. For example, many thefts occur at night or early in the morning when there are less staff on duty. With CCTV you don’t have to physically be in your store to catch a shoplifter in the act. If one of your employees calls you and says there’s someone suspicious lurking around, you can see for yourself directly from your phone. If you’re concerned that some of your employees may be stealing, CCTV can also be used to catch them in the act. Generally, insurance companies want to insure retail clients who are taking measures to protect their property. The more security you have in place, such as a CCTV system, the less likely you are to see a spike in your insurance rates. Moreover, if your store does incur damage due to theft or vandalism, you can prove it to your insurance company because you’ll have caught it all on tape. With the holidays fast approaching, if you haven’t installed CCTV on your premises yet, you should consider it. CCTV helps protect your employees, your property from vandalism, and your merchandise from theft by shoplifters.